Jewel began as a band of door-to-door salesmen, selling tea and coffee from the back of horse-drawn wagons. Founded by Frank Ross and his brother-in-law Frank Skiff in 1899, the company launched with just $700, a rented horse, and a secondhand wagon. The partnership named their venture the Jewel Tea Company, the routemen called on their customers bi-weekly, coming directly to their homes. Over time, the company added hundreds of new routes across the nation, and the traveling Jewel salesman came to be a familiar, welcomed sight. Throughout the 20th century, the company continued to expand. As Jewel acquired other supply chains and Chicago-area grocery stores, the company began operating under the name Jewel Food stores. In 1934, Jewel Food Stores merged with Jewel Tea Company. By the start of the 1940s, customers could also place their orders from a catalog, with merchandise delivered by mail. 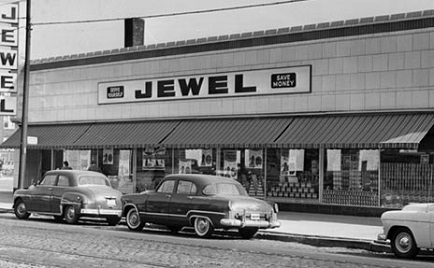 By the late 1950s, Jewel also secured food stores from the downstate Illinois and west central Indiana regions, continuing its expansion in the 1960s through the acquisition of Osco Drugs, leading to the debut of Jewel-Osco combination stores. Throughout the 1960s and 1970s, Jewel constructed many Jewel Foods/Osco Drugs stores as side-by-side operations. Between 1970 and 1990, Jewel moved or expanded most of its storefronts to freestanding buildings with ample parking. By 1983, the company moved to consolidate Jewel and Osco stores together as a singular business unit under one roof. Today, the two stores present to the customer as a singular entity. Today, Jewel-Osco is a vital part of Albertsons Inc., a privately held grocery company that is proud to continue serving the Chicagoland area and beyond. In 2013, our parent company—AB Acquisition LLC—acquired Jewel-Osco from SUPERVALU. This transaction brought all Albertsons stores under singular ownership, and additionally expanded to include ACME Markets, Shaw’s and Star Markets to its growing roster of food and drug retailers. In 2015, the parent company doubled its store base through the completion of a merger with Safeway. At present, Jewel-Osco operates 187 stores throughout the Chicagoland area, Indiana and Iowa, part of a 2,200+ store operation employing over 265,000 people nationwide. All our stores—no matter under which banner they operate—were founded on the philosophy of offering customers the products they want at a fair price, with lots of tender, loving care. We still open our doors every day today with that core value in mind—and because of it, we run really great stores.